FEB 26, 2008 – Malcolm in THE FULL MONTY! 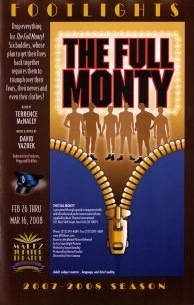 Adam plays Malcolm, the suicidally-hopeless-but-lovable nerd who still lives with his Mom, in the Maltz Jupiter Theatre‘s production of THE FULL MONTY, the hit Broadway musical based on the film. Also featuring classic comedienne Mimi Hines, the show is directed by Alan Souza and runs until March 16.